← The Future for Local and Regional Media. “Twitter is one of a range of new social media technologies that allow for the online and instant dissemination of short fragments of data from a variety of official and unofficial sources.” (Hermida, 2010). Twitter is a platform to help organise information, communicate with the public and access any news on current events. This was evident in many key and major events such as, Mumbai attacks, US presidential elections and Hurricane Sandy. I am not saying that Twitter was used in the right and correct way during these events but the majority of the time Twitter was relied on to provide up-to-date information. This shows its sheer importance during this day of age. Organisations have adopted the idea of using Twitter and have also in the past used it to their advantage. US State Department asking Twitter to delay routine maintenance during the Iranian poll as the service was an important toll used by Iranians to coordinate protests.” (Shiels, 2009). The UK national newspapers adopted 121 twitter accounts by July 2009, with a mass audience and amount of followers reaching over a million people. This shows that organisations and newspapers do understand how much influence these micro-blogging services, such as Twitter, have on today’s society. “One of the most popular micro-blogging platforms is Twitter. Between April 2008 and April 2009, the number of Twitter accounts rose from 1.6 million to 32.1 million.” (Vascellaro, 2009). This growth was also fuelled by the increase of celebrities such as Oprah Winfrey joining the ‘Twitterfield’. 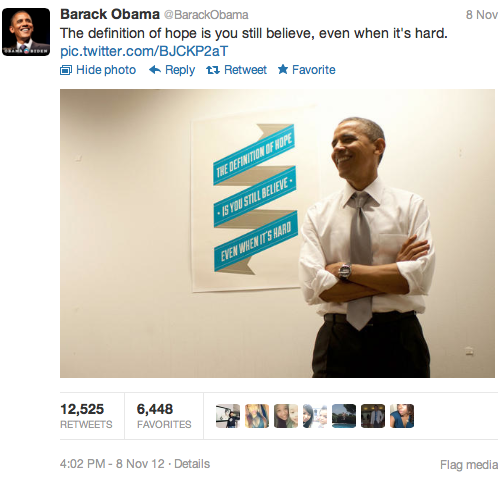 After the Presidential election 2012, Obama tweeted this inspirational image. It shows that even powerful figures such as the United States of America is using this micro-blogging tool as a form of PR and a form of spreading information. This particular tweet created a lot of interest with 12,525 retweets and 6,448 favourited tweets. It is evident that twitter users embrace all the technologies of Twitter. The service has been described as “an example of end-user innovation” (Johnson, 2009). Users embrace the #hashtags and the @reply, which generates the interest and spreading of information fast and concisely. As a Twitter addict myself, I try to ensure I use these specific tools to generate interest in my tweets and to be honest – to get noticed. (I am a Journalist student). Journalist however have become their own gatekeepers on the information they want from micro-blogging sites. They can filter and look deeply into each piece of information if they wish. All this information (even if it is inaccurate) is an advantage for journalists. This user-generated information can provide evidence to events when journalists could not be there themselves. There are now some technology platforms that provide this type of service such as, Hootsuite and Tweetdeck. Has this micro-blogging phenomenon changed and ruined journalism? I think not. I think it has just provided another form of accessing journalism in a quicker and more concise way. Posted on November 14, 2012, in Twitter and tagged addict, advantage, alfred hermida, ambient, blogging, data, ellen goodman, followers, hashtags, hurricane sandy, inspirational, journalist, media, mimbai attacks, newspapers, Obama, Oprah Winfrey, presidentail election, retweets, society, sources, technologies, twitter, twitter accoutns, twitter field, UK, us presidential elections, use, use of twitter. Bookmark the permalink. 1 Comment.